Word from Michael: Allow Your Kids to Connect Their Own Dots. 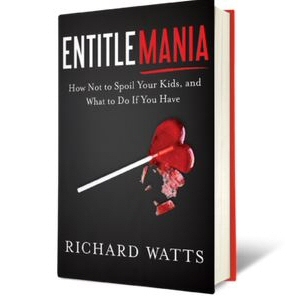 That is some the fascinating advice in this guest blog post from Richard Watts, author of ENTITLEMANIA. Do you worry that your kids already have a damaging sense of entitlement? Just want to make sure that you are raising them in a way that avoids the trap of entitlement? Richard Watts: Kids are resourceful and resilient little creatures. Left alone, their imagination takes them to places where they find laughter and challenge, struggle and victory. As they encounter a myriad of life forces, both positive and negative, they slowly develop their unique character which will serve as the framework from which they view the rest of their lives. So what exactly is the role and value of a parent? Other than feeding them, providing basic necessities of shelter and clothing, and protecting them from physical injury, what do we really do as parents? Are we supposed to be their best friends? What benefit do they derive from that? Are we supposed to help them avoid the mistakes we made when we were young? If they don’t make mistakes, how will they learn not to make them again? What would be the result if you were tireless in allowing your kids to be free to discover the promise and peril of any direction they wish to venture, so long as you allow them to experience the consequences of their choices? I’m not suggesting you turn your kids to the streets . . . but close. The barrier to encouraging this kind of freedom is that you find it intolerable to watch your kids struggle. Especially when you have the fix and can help them avoid the pain. We parents, albeit well intentioned, are impatient and intolerant of the delays in our own kids’ gratification. Parents project their own life struggles into their innocent children’s lives, and strive to avoid allowing their kids to repeat their own failures and faults. We spin the truth about how difficult life usually is, and refuse to admit that much of life is putting one’s nose to the grind stone, and at the same time, trying to remain hopeful things will improve. But in doing so, we are only delaying their road to maturity. It becomes more difficult for your kids to recover from entitlemania as they grow older, mainly because the problems and issues become more complex. 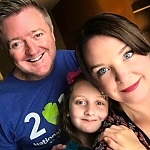 Giving your kids an assist in side-stepping the rough portions of life’s journey handicaps them by denying them the opportunity to gather essential life skills along the way. Inevitably, we can become codependent and allow our parental drone to go tactical; the stealth, all-seeing parent who sets up shop to surveil and respond instantly to your child’s every need. You might as well have your kids wear a body cam because they are walking real time with a parental audience. Your kids’ childhood of independent and unique thinking can soon segue into a programmed course designed by you. In trying to give your kids everything you didn’t have, you forgot to give them what you did have. As a parent, you know your kids are missing the struggles and failures that were attendant to your upbringing, but it’s just too painful for you to repeat again. Remember the Dot to Dot drawings growing up? They were an incomplete picture of consecutively numbered dots on a paper. You had little clue what the picture was going to be. To find out, you had to start with your pencil on #1 and connect a continuous line to #2, then #3, and so on. Some pictures only had twenty dots, while others had over a hundred. The more dots you connected, the more spectacular your surprise picture was. Every child starts with their own unique Dot to Dot life journey. If they are lucky, they are left alone to discover their unique journey. Parents in the process of creating kids with entitlemania, believe it is a benefit to help their children skip some of the number dots to help them get ahead, and avoid setbacks which are natural to personal growth. The child begins at #1, #2, #3, and the parent helps them skip ahead to #6, and later from #14 to #18. It is all done with love and the best of intentions to shorten the journey to an imaginary destination of the parents’ choosing. So what’s wrong with this picture? In the Dot to Dot drawing created especially for your own child, skipping the dots results in an incomplete picture. There are gaps. Each of these gaps represents a missed learning experience, struggle, awareness, awakening, or life course adjustment. This is the struggle that helps your child with present and future decision making, based on positive and negative outcomes. Your child is creating his or her own unique owner’s manual for their life and you ripped out several pages! Why? Because you think you’re helping? You see shortcuts for your child that avoid experiences you didn’t find helpful, and perhaps they are too painful to watch again in your child. Each of these experiences however helps shape the unique individual he or she is to become. And if you are loaded with expectations of your child’s success and believe there is no need for them to experience the setbacks and failures life wields, you are setting yourself and your child up for disappointment and frustration. Your child cannot know pleasure unless he has experienced pain, and it is better to experience pain, than to feel nothing at all. You may not need the page you ripped out of your child’s personal instruction manual, but they do! They need independence, self- awareness, and struggle. And that is only achieved through parents who carefully allow the natural forces of life, both positive and negative, to have these effects on their kids. Whether your kids are toddlers, teens, adolescents or adults, let them climb their own mountain, stumble, recover, and climb again. 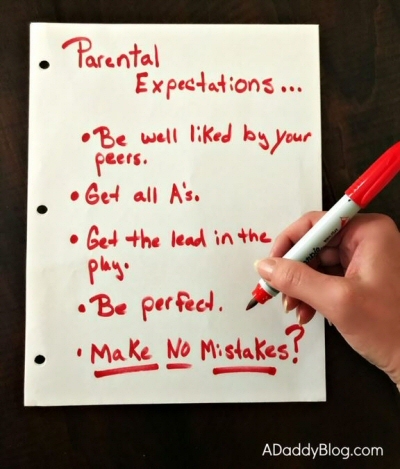 Make a list of your expectations for your kids so you know those things you must forget. Expectations are a breeding ground for unhappy kids and weak families. Leave them alone! Don’t try to be their best friend. Choose to be their parent. Let them earn self-pride. It will be their unexpected and unanticipated achievements that will surprise you, and make you beam with pride. When you witness your kid’s finding their own solutions to difficulties they encounter, it will give you a joy that is unmatched, even by your own accomplishments. Why not give it a try? Perhaps you will begin to understand what you may be intentionally doing to your kids . . . unintentionally.